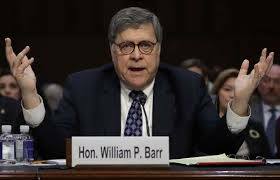 DemDaily: Who is William Barr? the next US Attorney General will control Special Counsel Robert Mueller's investigation into Russia's interference in the 2016 US Presidential election and possible collusion between Moscow and the Trump campaign. That person is likely to be William Barr. A native New Yorker, Barr received his B.A and M.A. from Columbia University and his law degree from George Washington University. From 1973 to 1977, Barr was employed by the Central Intelligence Agency, followed by a one-year tenure as law clerk to Judge Malcolm Wilkey of the US Court of Appeals for the District of Columbia Circuit. He served on the domestic policy staff at the Reagan White House from 1982 to 1983, before going on to private practice with the Washington law firm of Shaw, Pittman, Potts & Trowbridge. In 1989, Barr was appointed by President George HW Bush as Assistant Attorney General for the Office of Legal Counsel, where he was known as a strong defender of Presidential power. In 1990 Barr was appointed Deputy Attorney General where he took hardline immigration stances, advocating for the use of Guantanamo Bay to prevent Haitian refugees and HIV infected individuals from claiming asylum in the United States. In 1991, when then-Attorney General Richard Thornburgh resigned to run for the Senate, was named Acting Attorney General before being approved unanimously by the Senate Judiciary Committee and confirmed by the Senate as the 77th US Attorney General. During his 1991 confirmation hearings, Barr stated he believed the constitution was not originally intended to create a right to abortion; that Roe v. Wade was thus wrongly decided; and that abortion should be a "legitimate issue for state legislators." Upon leaving the DOJ in 1994, Barr was appointed by Virginia Governor George Allen to co-chair a commission to reform the criminal justice system and abolish parole in the state. The same year he became Executive Vice President and General Counsel of GTE Corporation, where he served for 14 years, and from 2010 to 2017 worked with the law firm of Kirkland & Ellis. On December 7, 2018, President Donald Trump announced his nomination of Barr for Attorney General to succeed Jeff Sessions. 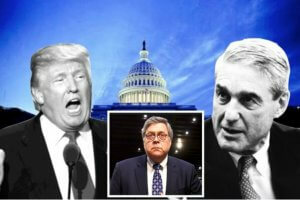 According to YahooNews, Trump had tried to hire Barr as his chief defense lawyer regarding the Mueller investigation after Barr wrote an Op-Ed in The Washington Post in May of 2017, vigorously defending the President's firing of former FBI Director James Comey. Barr has also publicly criticized the Special Counsel's conduct and questioned the appointments of some of Mueller's prosecutors due to political donations they had made to the Clinton campaign. Most significantly, Barr penned an unsolicited 20-page memo to the Department of Justice last year critiquing Mueller's investigation into the Russian election interference. In the June, 2018 memo, Barr maintains a president has "absolute" and "all-encompassing" constitutional authority over actions by executive branch officers in carrying out law enforcement powers given to them by Congress, including decisions about criminal investigation and prosecution. This week, on January 15th and 16th, William Barr appeared before the Senate Judiciary Committee for his confirmation hearings. Barr was vehement in his pledge to protect Special Counsel Mueller's investigation and see it through to completion, but would not commit to releasing the final report publicly or in its entirety. Barr is expected to be confirmed next month by the Republican-controlled Senate. Tonight’s “first in the nation” Iowa Caucuses kick off the Presidential nomination process.